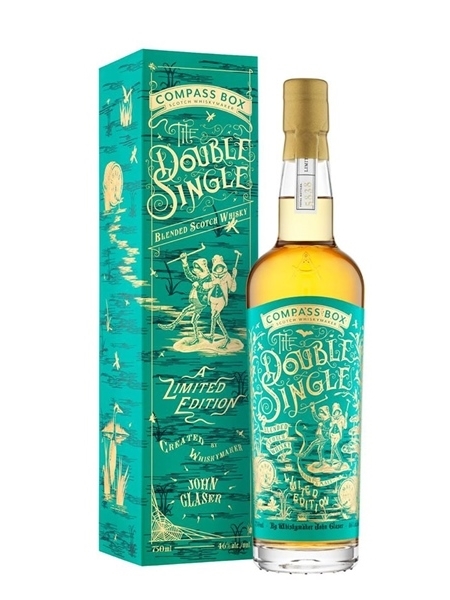 The Compass Box is a Scotch whiskymaking company founded in 2000 by American entrepreneur John Glaser, formerly a marketing director for Johnnie Walker. They exclusively blend, and with no distillery of their own a significant portion of their whisky comes from Clynelish distillery in the highlands. Creativity and innovation are at the heart of Compass Box, continuously challenging the way it's always been done. The Double Single, first released in 2003, is yet another example. This is the third edition of a challenge put to Glaser by bar owners to create true complexity in a blend with the minimum amount of components - two. For this addition, Glaser has selected single malt from Glen Elgin and single grain from Girvan distillery. The Glen Elgin was matured in re-charred, ex-bourbon hogsheads while the Girvan was matured in re-charred, ex-bourbon barrels. This edition is a run of just under 6000 bottles, non-chill filtered, natural colour and bottled at 46% ABV.